SEASIDE CORAL CANVAS WALL ART home decor, jewelry, decor, decorations, electronics, fountains, floor mats, art glass, vases, garden essentials, fireplace screens. 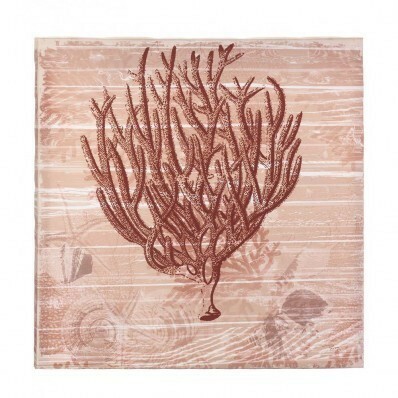 Invite this beautiful sprig of coral to decorate your room with under-the-sea style. Printed on canvas and stretched over a wooden frame, this artistic depiction of red coral is ready to be admired. Material(s): CANVAS WOOD - MDF. Weight 1.6 pounds . Dimensions 15.5" x 1.62" x 15.5".